As my summer garden's harvest dwindles down to the stuff the rabbits and squirrels didn't think was good enough, it's time to access the usable bits and try to make them last through the winter. I have a few tomatoes, some eggplant, lemongrass, shiso, basil and lots of green herbs. So here is a recipe for a veggie galette, a whole wheat crust folded over a bed of vegetables cheese and fresh herbs — perfect vegetarian main dish with a salad. 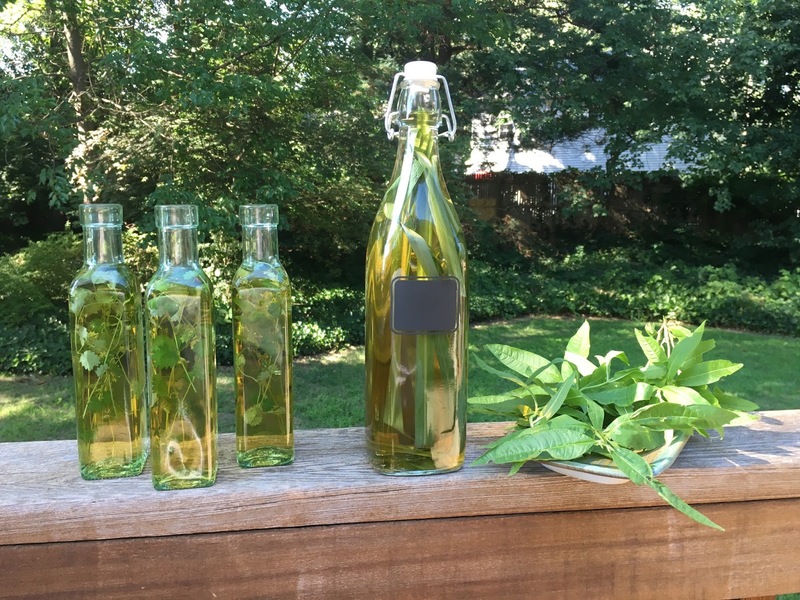 The other fun thing to do to save summer is infuse vinegars and make herbal simple syrup. Dump mixture to a large bowl; drizzle with vinegar and ¼ cup ice water. 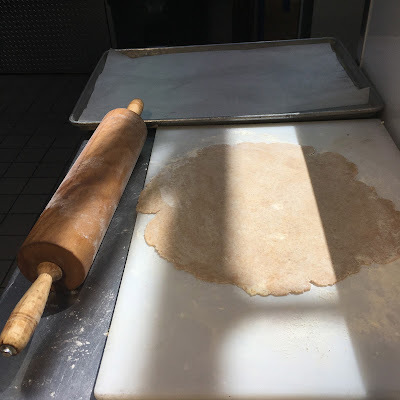 Mix with a fork, adding more ice water by the tablespoonful if needed, just until a shaggy dough comes together; lightly knead until no dry spots remain (do not overwork). Form a disk and wrap in plastic. Chill at least 2 hours or overnight. Preheat oven to 400°. Shred up your cheese and set aside. Sauté your greens or vegetables and season with fresh herbs. Squeeze out extra liquid from greens, and set aside. Roll out dough on a lightly floured sheet of parchment to a 14” round about 1/8-inch thick. Transfer on parchment to a baking sheet. Brush crust with egg wash leaving a 2 inch border dry and sprinkle with Panko to help absorb extra moisture. Then layer in your ingredients. 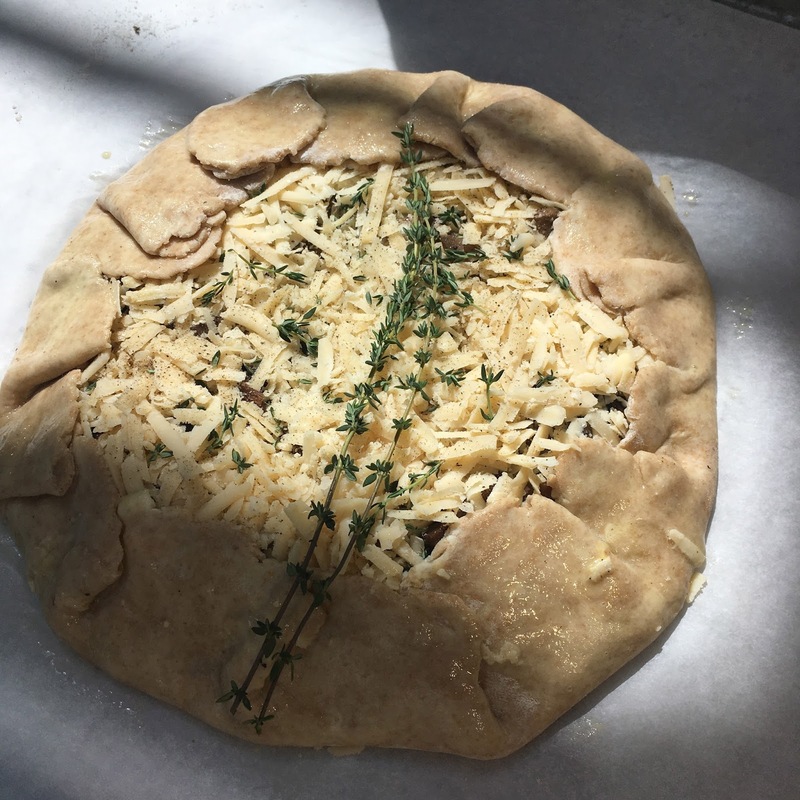 Bring edges of dough up and over filling, overlapping as needed, to create a 1 1/2-inch border; brush with egg and sprinkle with sea salt and fresh herbs. 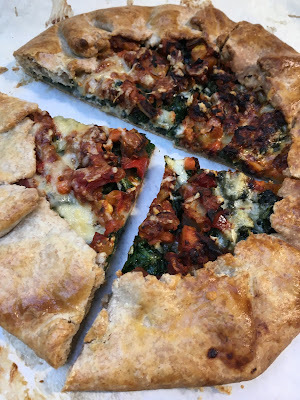 Bake galette, rotating once, until crust is golden brown and cooked through, 35 to 40 minutes. Let cool slightly on baking sheet. Serve warm or at room temperature. To make flavored vinegars, start with good quality organic apple cider vinegar and some clean glass bottles with tops. Stuff bottles with an assortment of herbs then fill with vinegar. I made four bottles of Salad Burnett infused vinegar (which tastes like celery) and one bottle of lemongrass vinegar using the long beautiful leaves. You just need to store it in a dark, cool place for 3 weeks, shaking it up occasionally. Then you can remove herbs or leave them in place. As you all know, a simple syrup is made of equal parts of sugar and water boiled for 3 to 5 minutes until it is clear. Then you remove the syrup from the heat, add the herb and let it sit in syrup 30 minutes, strain out, and refrigerate. Great with seltzer, or in a cocktail. Some of my favorites syrups are bay leaf, rosemary, lemon verbena, tarragon (great in limeade).